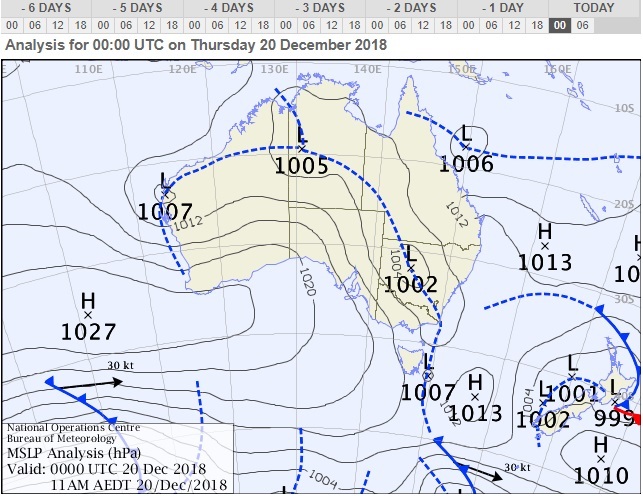 "....that a nascent Typhoon/Cyclone pair [with its accompanying WWBs] will develop somewhere between the islands of Sulawesi [MJO phase 5] and the Solomons [MJO phase 6] between the 18th and 20th of December 2018. 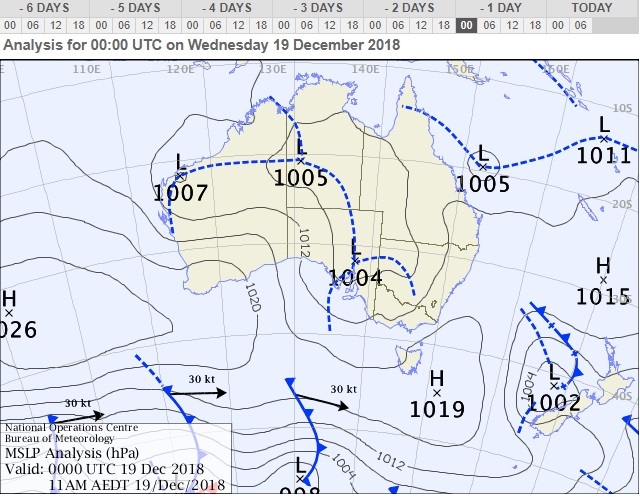 Here is the gradient wind analysis for the West Pacific region issued by the Australian Bureau of Meteorology (BOM) for 00 UT on the 20th of December 2018. 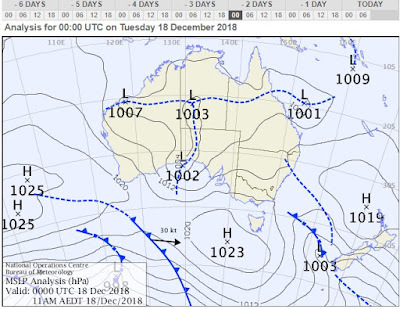 Notice that, as predicted, a burst of westerly winds has developed between the low-pressure cells that have developed over the Northern Territory of Australia (N.T.) and to the east of the Philipines. the 23rd and 25th of December. The Moon's orbit is tilted by approximately five degrees compared to the Earth-Sun plane. The net effect of this is that the strength of Lunar-tides near the mid-latitudes of the Earth's surface varies in strength over a cycle of 18.6 years. This 18.6-year Draconic cycle is also clearly evident in the small changes that take place in the rate of rotation of the Earth. 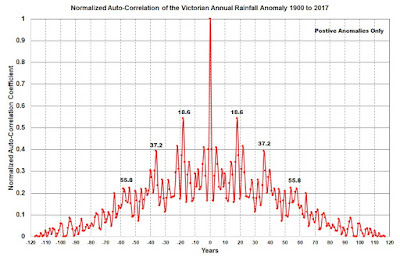 Confirmation of the 18.6-year periodicity in the positive annual rainfall anomalies is provided by the auto-correlation of the Victorian annual rainfall anomalies between 1900 and 2017. 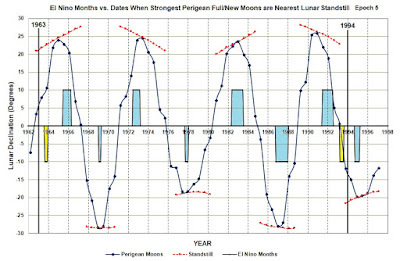 Note the effect of the short-term 4-year alignment of the lunar tidal cycles with seasons superimposed upon the 18.6-year cycle. Are MJOs affected by the lunar-induced (bi-monthly) acceleration and deceleration of the Earth's rotation? The reader is strongly encouraged to visit this excellent blog site to get a much more detailed description of this phenomenon. In order to answer the proposed question, we must first have an understanding of the main characteristics of Equatorial Kelvin Waves (EKWs), Equatorial Rossby Waves (ERWs) and Madden-Julian Oscillations (MJOs). 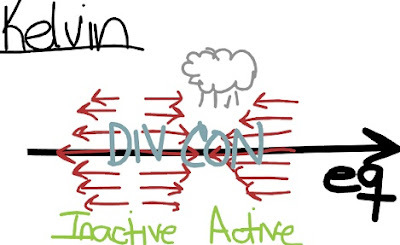 An Equatorial Kelvin Wave (EKW) is a coupled area of atmospheric divergence and convergence (i.e. high and low pressure) that travels along the Earth's equator from west to east (see figure 1). The Earth's Coriolis force turns the equator into a waveguide that rapidly suppresses any meridional (north-south) wind components of the EKW. Hence, the dominant wind components of the EKW are almost exclusively zonal (west-to-east) in nature. 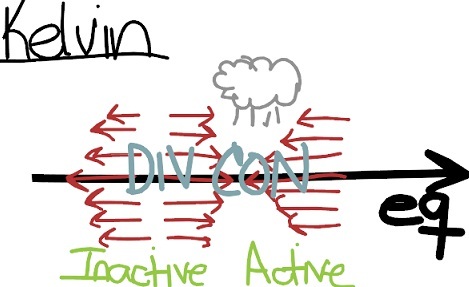 The active or convergence (low pressure) part of an EKW is associated with convection/clouds and precipitation. It is preceded by a region of easterly zonal winds and followed by a region of westerly zonal winds. The phase velocity of an EKW is typically 15 -- 20 m/sec (west-to-east) over the Western Pacific ocean and 12 -- 15 m/sec (west-to-east) over the Indian Ocean. [N.B. EKWs are non-dispersive waves, so their phase velocity is equal to their group velocity]. 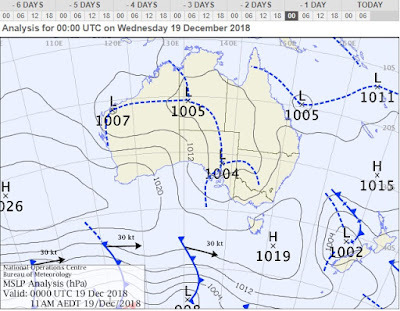 The slower speed of an EKW over the Indian Ocean is attributed to the fact that the wave is coupled with the atmospheric convection and precipitation. N.B. The west-to-east velocity of the Moon along the Ecliptic (as seen from the Earth's centre) varies between 15.2 -- 19.8 m/sec. This is very close to the west-to-east group (and phase) velocity of 15 -- 20 m/sec of the convectively-decoupled EKW. 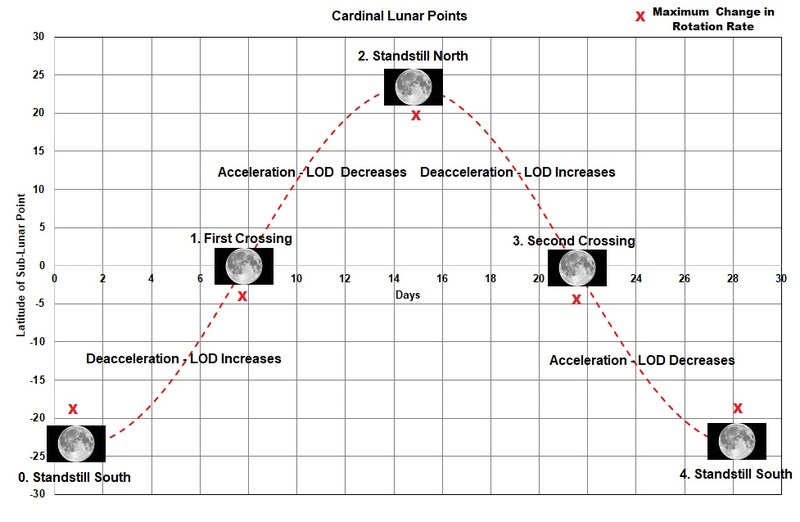 Speculation: If you were to observe the Moon from a fixed point on the Equator at the same time each day, you would notice that the sub-lunar point on the Earth would appear to move at a speed of 15 to 20 m/sec from west-to-east. This suggests that lunar tides are emphasizing or reinforcing a weather phenomenon that routinely occurs at roughly the same time each day. One such phenomenon could be the peak in convective thunderstorm activity that routinely takes place at roughly the same time each afternoon along the equator. 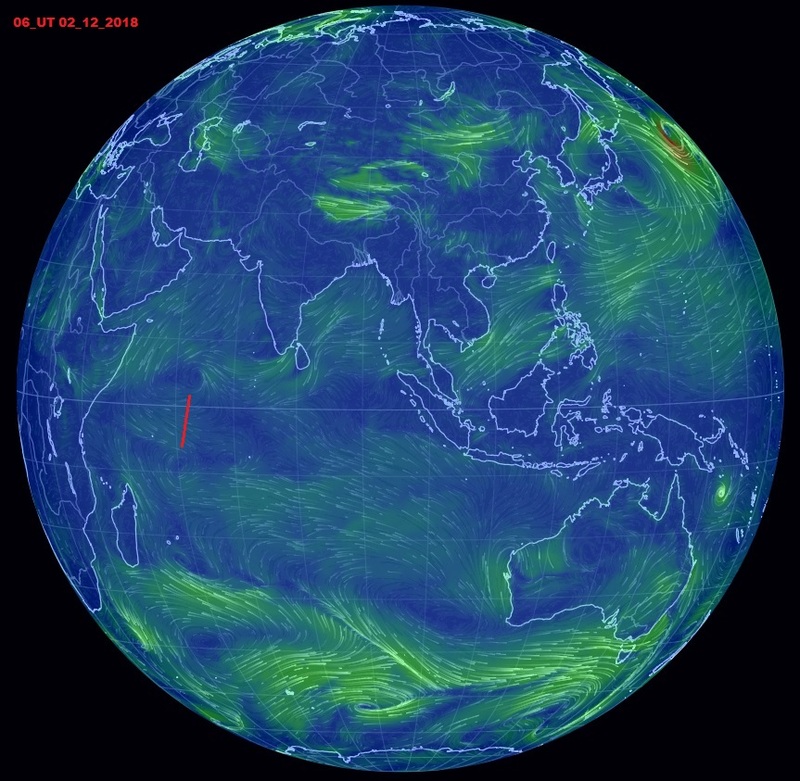 The zone of westerly winds at the back of the active phase of an EKW is associated with Westerly Wind Bursts (WWBs). 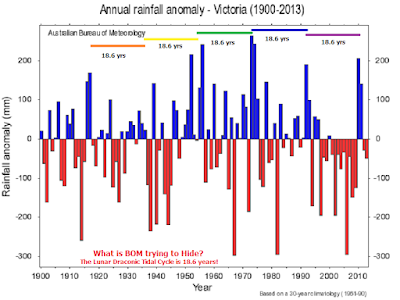 These wind bursts are thought to be involved in the triggering of El Nino events. EKWs travel through the more slowly moving MJO, with nearly every MJO having an EKW at some point in its life. The active (i.e. convective) phase of an EKW can cause weak Rossby waves trains to develop. EKW can provide favorable conditions for the development of tropical cyclones. These are twin cyclone/anti-cyclone pairs that produce convective zones that are displaced either side of the Earth's equator. Equatorial Rossby Waves (ERWs) come in a number of forms. Figure 2 shows the structure of an n=1 ERW. Twin cyclones and twin convective zones displaced either side of the equator are often associated with this type wave. The whole wave structure moves from east-to-west at roughly 5 m/sec. Outflows from the zones of convection can cause Rossby wave trains to develop. As with the EKWs, WWBs will form along the equator between the two low-pressure cells. Twin cyclones can spin off and become tropical depressions. The Madden Julian Oscillation (MJO) is the dominant form of intra-seasonal (30 to 90 days) atmospheric variability in the Earth’s equatorial regions (). It is characterized by the eastward progression of a large region of enhanced convection and rainfall that is centred upon the Equator. This region of enhanced precipitation is followed by an equally large region of suppressed convection and rainfall. The precipitation pattern takes about 30 – 60 days to complete one cycle when seen from a given point along the equator (, ). At the start of the enhanced convection phase of an MJO, a large region of greater than normal rainfall forms in the far western Indian Ocean and then propagates in an easterly direction along the equator. 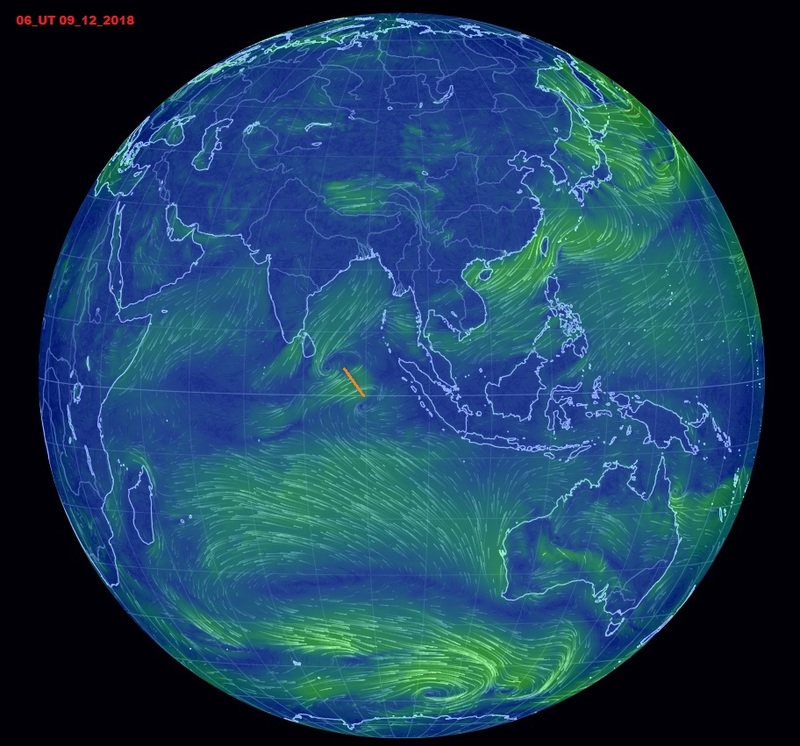 This region of enhanced rainfall travels at a speed of ~ 5 m/sec across the Indian Ocean, the Indonesian Archipelago (i.e. the Maritime Continent) and on into the western Pacific Ocean. However, once it reaches the central Pacific Ocean, it speeds up to ~ 15 m/sec and weakens as it moves out over the cooler ocean waters of the eastern Pacific. A MJO consists of a large-scale coupling between the atmospheric circulation and atmospheric deep convection. When an MJO is at its strongest, between the western Indian and western Pacific Oceans, it exhibits characteristics that approximate those of a hybrid cross between a convectively-coupled Kelvin wave and an Equatorial Rossby wave (, , ). MJOs are larger scale structures than either EKWs or ERWs. 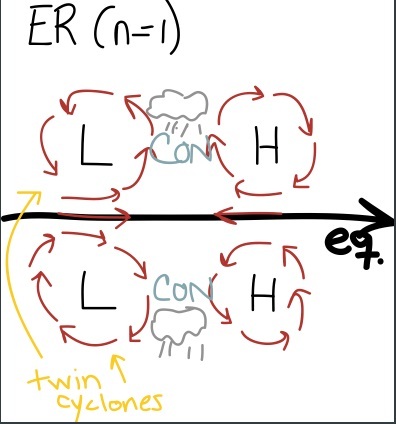 Figure 3 shows the hybrid structure of an MJO that resembles a cross between a convectively-coupled EKW and an ERW. As with the EKWs, MJO's can spawn twin cyclones that can spin off and become tropical depressions. Since MJO's are slower moving that EKWs, they tend to produce stronger and longer lasting WWBs than those produced by EKWs. Final Comments on the role of MJOs in spawning WWBs that trigger El Nino events. 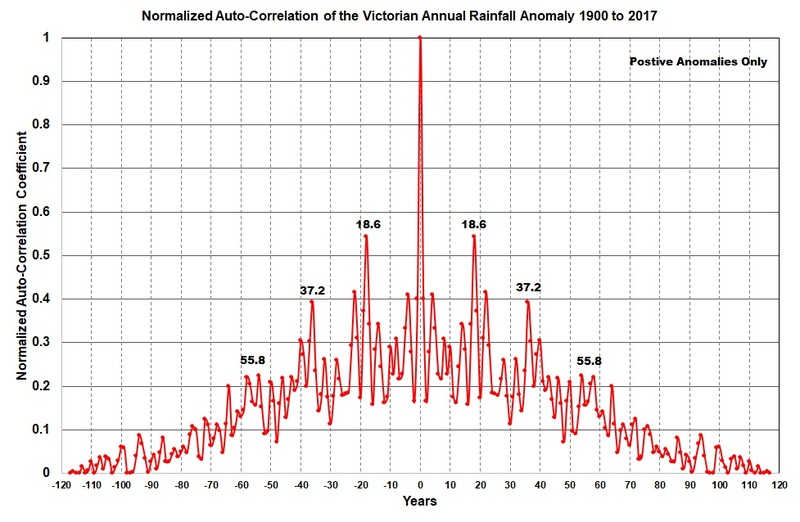 "There is strong year-to-year (interannual) variability in Madden–Julian oscillation activity, with long periods of strong activity followed by periods in which the oscillation is weak or absent." "This interannual variability of the MJO is partly linked to the El Niño-Southern Oscillation (ENSO) cycle. In the Pacific, strong MJO activity is often observed 6 – 12 months prior to the onset of an El Niño episode but is virtually absent during the maxima of some El Niño episodes,.."
2. Zhang, C. (2005), Madden-Julian Oscillation, Rev. Geophys., 43. 3. 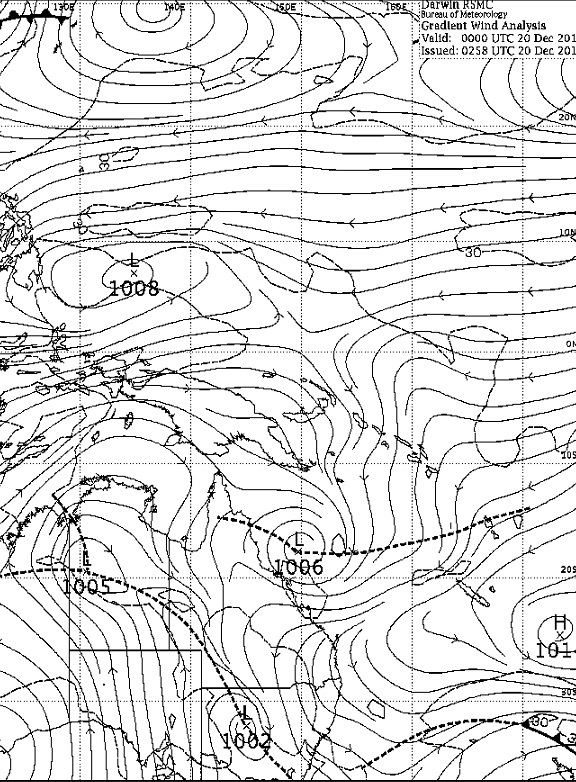 Madden R. and P. Julian, 1971: Detection of a 40-50 day oscillation in the zonal wind in the tropical Pacific, J. Atmos. Sci., 28, 702-708. 4. Madden R. and P. Julian, 1972: Description of global-scale circulation cells in the tropics with a 40-50 day period. J. Atmos. Sci., 29, 1109-1123. 6. Kang, In-Sik; Liu, Fei; Ahn, Min-Seop; Yang, Young-Min; Wang, Bin., 2013, The Role of SST Structure in Convectively Coupled Kelvin-Rossby Waves and Its Implications for MJO Formation, Journal of Climate, vol. 26, issue 16, pp. 5915-5930. 8. Roundy, P.E. ; Kravitz, J.R. (2009). "The Association of the Evolution of Intraseasonal Oscillations to ENSO Phase". J. Climate. 22: 381–395. 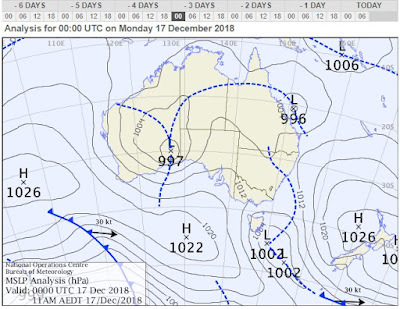 Is the Next Big Westerly Wind Burst On Its Way? Hypothesis: During periods leading up the onset of El Nino events, nascent Typhoon/Cyclone pairs associated with the active phase of Madden Julian Oscillations are reinforced either at or 1-2 days after the maxima or minima in the Earth's rotation rate that are induced by the monthly lunar tides. This figure shows that on the 02-12-2018 the new MJO was just moving into phase 1 and that by the 09-12-2018 it was starting to progress into phase 3 [see the locations marked on the left of the diagram above]. The current maxima & minima in the lunar-induced deviations in the Earth's rotation rate. 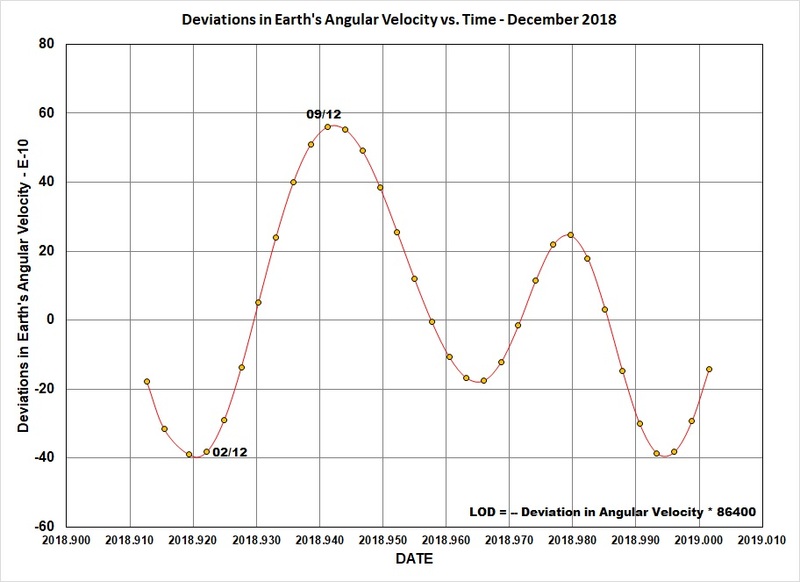 The next figure shows the deviations in the Earth's angular velocity that are specifically induced by the lunar tides for the month of December 2018. Marked this plot are the angular velocities for the 02nd and 9th of December. Both occur on dates that are at, or just after, the dates of maxima or minima in the angular velocity. Sidorenkov, N.S., 2009: The Interaction Between Earth’s Rotation and Geophysical Processes, Weinheim: Wiley. What are the surface winds doing around the times of Max/Min in the angular velocity? 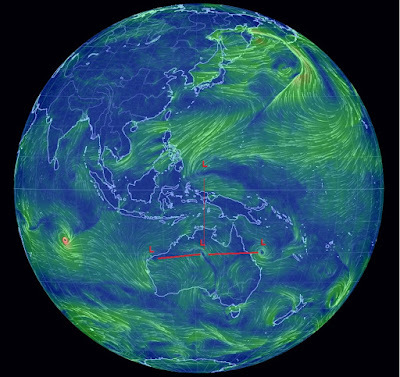 The next two figures show the surface winds of the Equatorial Indan and West Pacific Oceans for the 01-12-2018 and the 02-12-2018 [both at 06 UT]. Comparing these two figures shows that on the 2nd of December a nascent Typhoon/Cyclon pair develops in the region associated with MJO phase 1 (i.e. the far western equatorial Indian ocean). 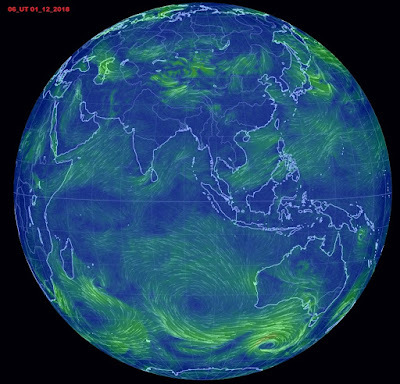 The next two figures show the surface winds of the Equatorial Indan and West Pacific Oceans for the 08-12-2018 and the 09-12-2018 [both at 06 UT]. Comparing these two figures shows that on the 9th of December a nascent Typhoon/Cyclon pair [with its accompanying WWBs] develops in the region associated with MJO phase 3 (i.e. between islands of Sri Lanka and Sumatra). If the hypothesis is correct [N.B. this prediction is based upon the assumption that the current MJO event does not stall but penetrates into the equatorial western Pacific ocean], it predicts that a nascent Typhoon/Cyclone pair [with its accompanying WWBs] will develop somewhere between the islands of Sulawesi [MJO phase 5] and the Solomons [MJO phase 6] between the 18th and 20th of December 2018. Moderate-to-strong El Niño events in the Full Moon epochs preferentially occur near times when the lunar line-of-apse aligns with the Sun at the times of the Equinoxes. 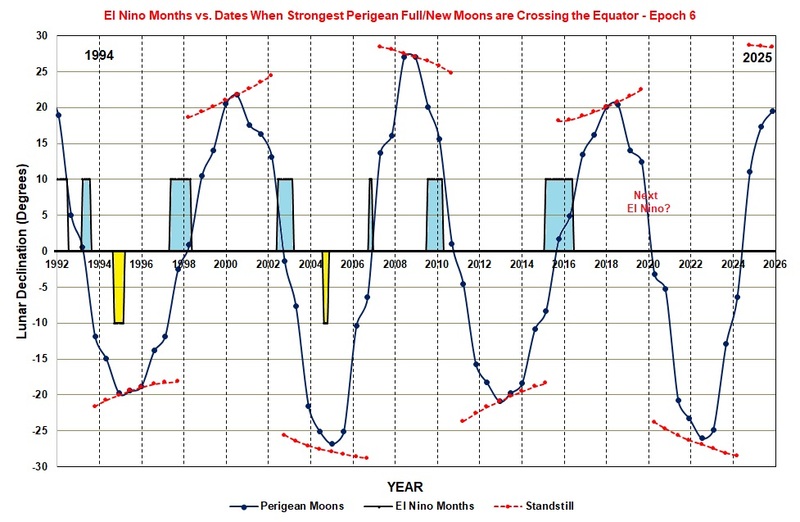 Note that this is equivalent to saying that moderate to strong El Niño in Full Moon Epochs preferentially occur near times the strongest Perigean New/Full moons are crossing the Earth's equator. Moderate-to-strong El Niño events in the New Moon epochs preferentially occur near times when the lunar line-of-apse aligns with the Sun at the times of the Solstices. 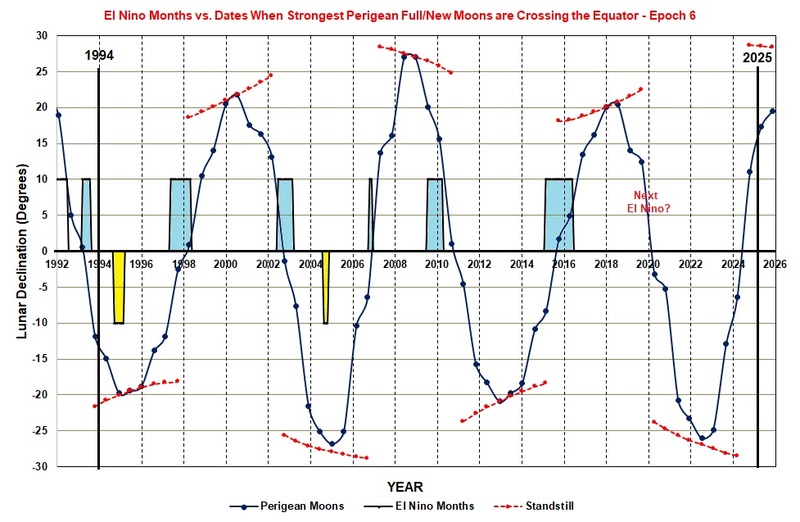 Note that this is equivalent to saying that moderate to strong El Niño in New Moon Epochs preferentially occur near times the strongest Perigean New/Full moons are near lunar standstill. Note: The El Nino events in Epoch 5 (shown above) that obey the general rule are arbitrarily flipped up and down to highlight the synchronicity with the Perigean lunar cycle (i.e. blue curve). of these 1915, 1969, and 2006 obey the general rules, while 1923 and 2004 do not obey the general rules. The 1931 event is a transitional event. 3. If you exclude the six sub-threshold events and the four transition events, this leaves 19 El Nino events. Conclusion: 89 % of the El Nino events (i.e. 17/19) obey the general rule. 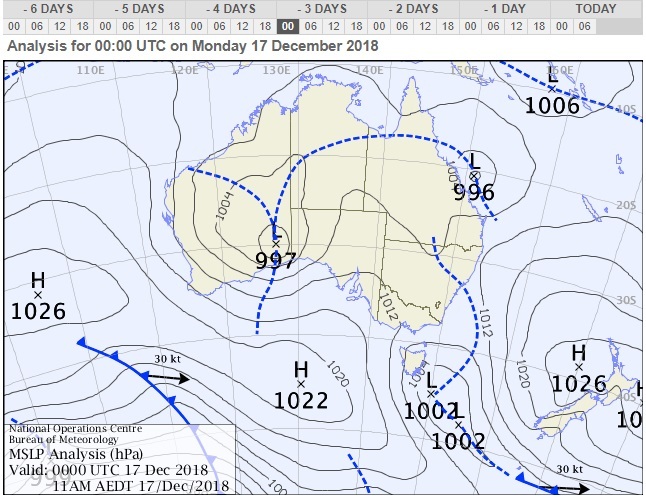 Is the November 2018 Madden Julian Oscillation (MJO) as a Possible Trigger for an El Nino? The Madden Julian Oscillation (MJO) is the dominant form of intra-seasonal (30 to 90 days) atmospheric variability in the Earth’s equatorial regions (Zang 2005). It is characterized by the eastward progression of a large region of enhanced convection and rainfall that is centered upon the Equator. This region of enhanced precipitation is followed by an equally large region of suppressed convection and rainfall. The precipitation pattern takes about 30 – 60 days to complete one cycle, when seen from a given point along the equator (Madden and Julian 1971, 1972). 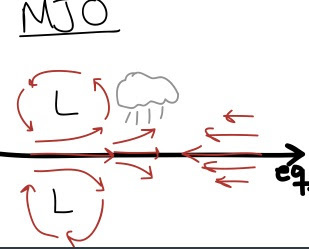 Wheeler and Hendon (2004) have developed a Real-time Multivariate MJO (RMM) Index that tracks the strength and movement of the enhanced-convection phase of MJOs. This index is based upon the first two Empirical Orthogonal Functions (EOFs) of the combined fields of the equatorially averaged (15°S to 15°N) outgoing longwave radiation (OLR), 850 hPa zonal wind and 200 hPa zonal wind data for the period from 1979 to 2001. In order to track the strength and movement of the enhanced-convection phase of MJOs, a two-dimension phase-space diagram is created by plotting the daily values of RMM2 against RMM1 (Wheeler and Hendon 2004) [Please see the diagram on the left-hand side of the following figure for the phase-space diagram for October/November 2018- BOM 2018]. In this phase diagram, the distance of a given daily data point from the origin [i.e. SQRT((RMM1^2)+(RMM2^2))] is an indicator of the strength of the enhanced-convection in the MJO. Distances greater than 1.00 indicate significant MJO activity. Additionally, the curve formed by joining the sequential daily data point, moves in an anticlockwise direction about the origin, with the anti-clockwise movement indicating the systematic eastward propagation of the MJO. The 360 degrees of the phase diagram is divided into eight octants which roughly correspond to actual physical locations along the Earth’s equator (Wheeler and Hendon 2004). The bottom right-hand side of the following figure shows the approximate locations of the first seven octants in the phase diagram. The eighth octant covers the sector that extends along the equator from East Africa to the International Date Line. One class of MJO that is of particular interest for this study are those that propagate into the western Pacific Ocean (i.e. octants 6 and 7 for the MJO Phase). The reason why this class of Pacific Penetrating Madden Julian Oscillations (PPMJO) is special is that they are often associated with westerly wind bursts (WWB’s) that are thought to play an important role in triggering the onset of El Nino events. The diagram in the top right-hand corner of the figure above shows the MJO phase (i.e. MJO octant number) versus time diagram for 2018 [up to November 17th]. 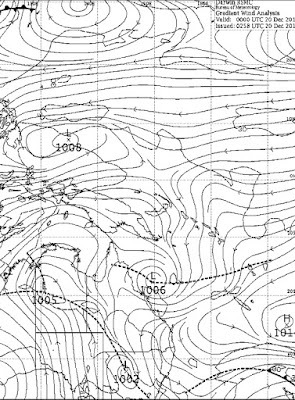 The current MJO event starting on the 31st of October is highlighted on the far right of this diagram. 2. A Connection Between Lunar Declination & Lunar-Induced Accelerations of the Earth. If you remove the annual and bi-annual seasonal component of the changes in the Earth’s LOD, you are left with the abrupt slowdowns in the Earth's rotation rate (roughly) once every 13.7 days cause by the effects of the lunisolar tides. A more detailed investigation of these semi-monthly changes in Earth’s rotation rate shows that the maxima in LOD (where the Earth is rotating most slowly) occur within a day or so of the time that the Moon crosses the Earth's Equator. This tells you that the slow down in the rotation rate (i.e. the maximum in LOD) is a direct result of the lunar tidal bulge in the Earth's oceans (and atmosphere) being dragged across the Earth's Equator by the Moon. The slow down occurs for much the same reason that a twirling ice-skater slows down their rate of spin by extending their arms i.e. by the conservation of angular momentum. Similarly, when the lunar tidal bulges in the Earth’s oceans (and atmosphere) reach their furthest point from the Earth’s equator (i.e. highest latitudes where lunar standstills take place), this brings the tidal bulges to their closest point to the Earth’s rotation axis. When this happens, the Earth’s rotation rate increases for the same reason a twirling ice-skater speeds up their rate of spin by pulling in their arms (again by the conservation of angular momentum). The following figure shows the connection between the rotation rate of the Earth and the Cardinal locations of the Moon's declination. This figure shows that the maximum rate of change in the Earth's rotation rate take place at (or near) times of lunar standstills (i.e. 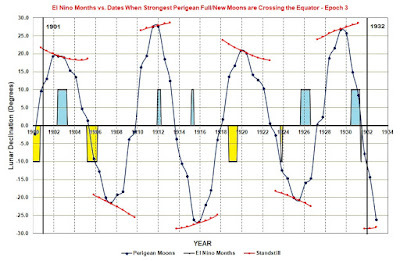 when the Moon's declination is furthest from the Earth's Equator) and lunar crossing of the Equator [Note the red crosses which mark the times of maximum change in the Earth's rotation rate]. 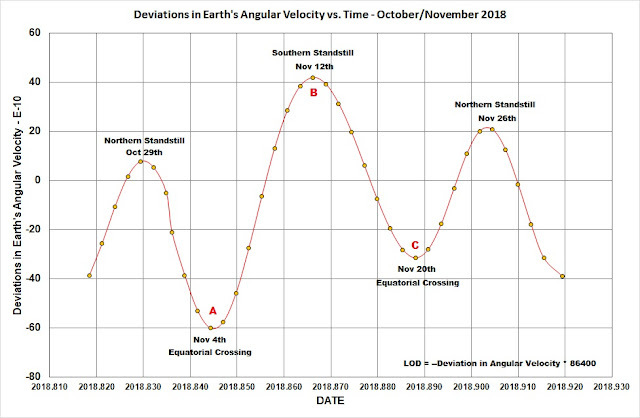 The next figure shows the deviations in the Earth's angular velocity between late-October and late-November 2018 [Sidorenkov 2009 - Note that the angular velocity can be converted to LOD in seconds by multiplying by -86400]. 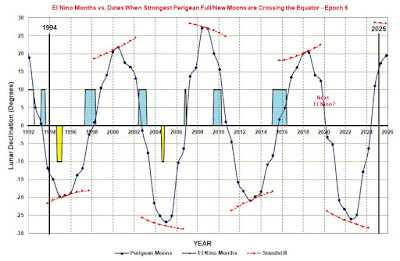 Highlighted in this figure are the rough times of the lunar standstills and the lunar crossings of the Earth's Equator. Remember that these correspond to the times of maximum change in the lunar-induced rotation rates of the Earth. Three points of maximum change in rotation rates, A, B, and C have been highlighted as they are used in the next discussion point. 3. Are Westerly Wind Bursts About to be Produced by the NOV 2018 MJO & Could They Trigger an El Nino Event? During ENSO neutral or La Nina conditions, the trade winds in the equatorial Pacific Ocean blow steadily from the east. However, just prior to the onset of an El Nino event, the easterly trade winds dramatically weaken. Lian et al. (2014) and Chen et al. (2015) have shown that for every major El Nino event since 1964, the drop off in easterly trade wind strength has been preceded by a marked increase in westerly wind bursts (WWB) in the western equatorial Pacific Ocean. These authors contend that the WWB generate easterly moving equatorial surface currents which transport warm water from the warm pool region into the central Pacific. In addition, the WWB create downwelling Kelvin waves in the western Pacific that propagate towards the eastern Pacific where they produce intense localized warming [McPhaden 1999]. It is this warming that plays a crucial in the onset of El Nino events through its weakening of the westerly trade winds associated with the Walker circulation. A meteorological phenomenon that produces WWB along the Earth's Equator is close Typhoon/Cyclone pairs that straddle the Earth's equator. The equatorial winds between the two intense low-pressure systems of a Typhoon/Cyclone pair blow steadily from west to east, weakening the prevailing equatorial trade winds. Consider the following hypothesis: Typhoon/Cyclone pairs are triggered by the abrupt changes in the Earth's rotation rate that are induced by the Moon over its monthly cycle. The left-hand side of the following figure shows a surface wind map of the Earth for 12:00 UT on the 19/11/2018. This wind map shows that there are three (or possibly four) Typhoon//Cyclone pairs staddled along the Equator between East Africa and the Western Pacific Ocean [These are marked with red "L" symbols connected by orange lines]. Also shown in this diagram is the path of the November MJO event between the 31st of October and the 19th of November (long red horizontal curve). 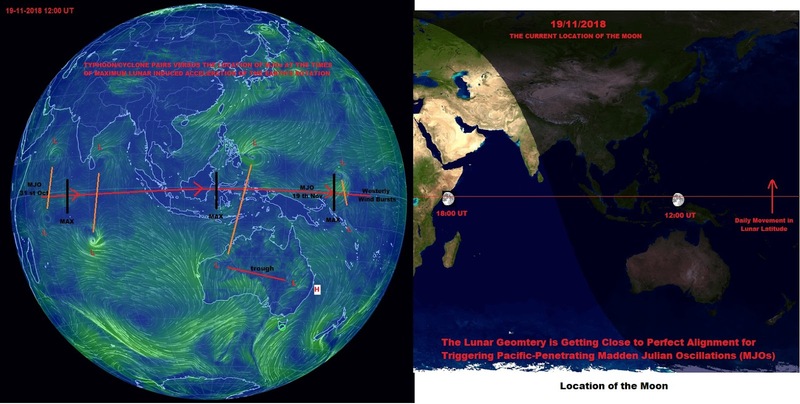 Along the path, there are three verticle dark lines showing where the MJO event was located when the lunar-induced rotation rate of the Earth was changing at its fastest rates. These took place on the 4th of November (just south of the Indian sub-continent), the 12th of November (off the East coast of Kalimantan), and the 20th of November (just to the east of New Britain and New Ireland). Amazingly, the location of the November MJO event when the lunar-induced changes in the Earth's rotation rate where are maximum appear to be close to the location of the Typhoon/Cyclone pairs. Could this be the link between the appearance of WWBs in the western equatorial Pacific Ocean (that are thought to be responsible for triggering El Nino events) and the Perigean New/Full Tidal cycle? 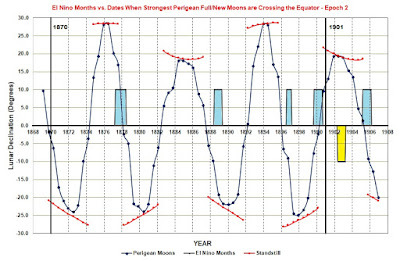 Perhaps when the strongest Perigean New/Full moon tidal events occur close to the times of lunar crossing of the Equator and lunar standstill, the powerful lunar-induced changes in the Earth's rotation rate, are conducive to forming strong WWBs in the western equatorial Pacific ocean, and it these WWB's that trigger Ell Nino events. Zhang, C., 2005: Madden-Julian Oscillation. Reviews of Geophysics, 43, 1-36. Madden R. and P. Julian, 1971: Detection of a 40-50 day oscillation in the zonal wind in the tropical Pacific, J. Atmos. Sci., 28, 702-708. Madden R. and P. Julian, 1972: Description of global-scale circulation cells in the tropics with a 40-50 day period. J. Atmos. Sci., 29, 1109-1123. Development of an index for monitoring and prediction. Mon. Wea. Rev., 132, 1917-1932. Australian Bureau of Meteorology (BOM), 2018: http://www.bom.gov.au/climate/mjo/ last accessed 20/11/2018. A new perspective, Geophys. Res. Lett., 41, 3522–3527. Chen, D., Lian T., Fu C., Cane, M.A., Tang, T., Murtugudde, R., Song X., Wu, Q. and Zhou, L., 2015, Strong influence of westerly wind bursts on El Niño diversity, Nature Geoscience, Vol. 8 No 5, pp. 339 – 345. Predicting the Start of the Next El Niño Event. 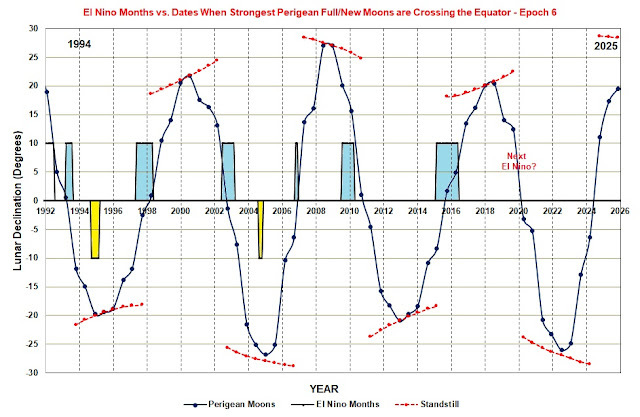 El Nino events start when the strongest Perigean New/Full Moons are crossing the Earth's Equator. El Nino events start when the strongest Perigean New/Full Moons are near lunar standstill. 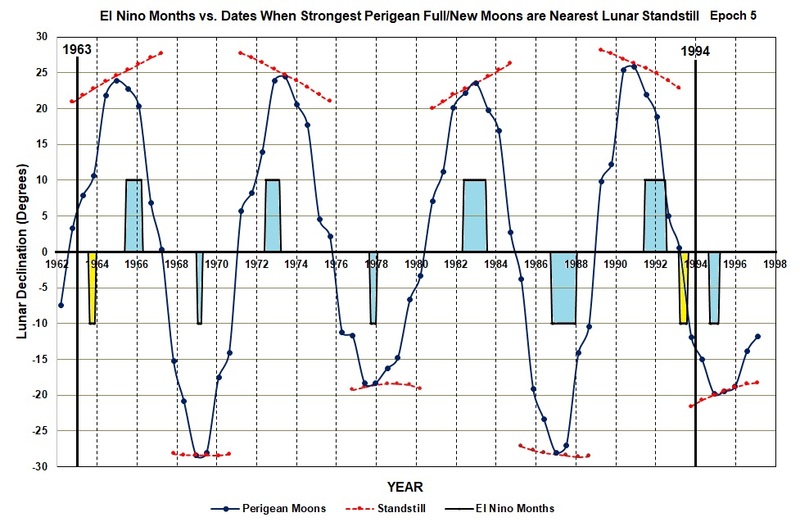 Firstly, the following graph shows the astronomical declination of the strongest Perigean New/Full moon between 1962 and 1997 (solid blue line)(1). 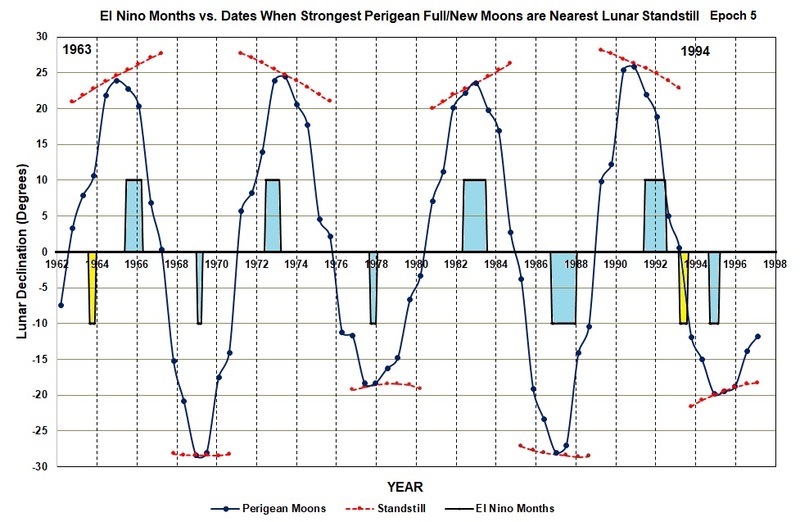 These are the strongest lunar tidal events during the 5th (New moon) Epoch that spans the period between the 23rd of April 1963 and the 25th of April 1994. The declinations of strongest Perigean New/Full moons reach their maximum distance from the Celestial Equator once every 4.425 (= 8.850 / 2) tropical years, as a result of the slow prograde precession of the lunar line-of-apse with respect to the stars. Secondly, the graph shows the declination at which the Moon reaches lunar standstill near the times of the strongest Perigean New/Full moon events (dashed red lines). 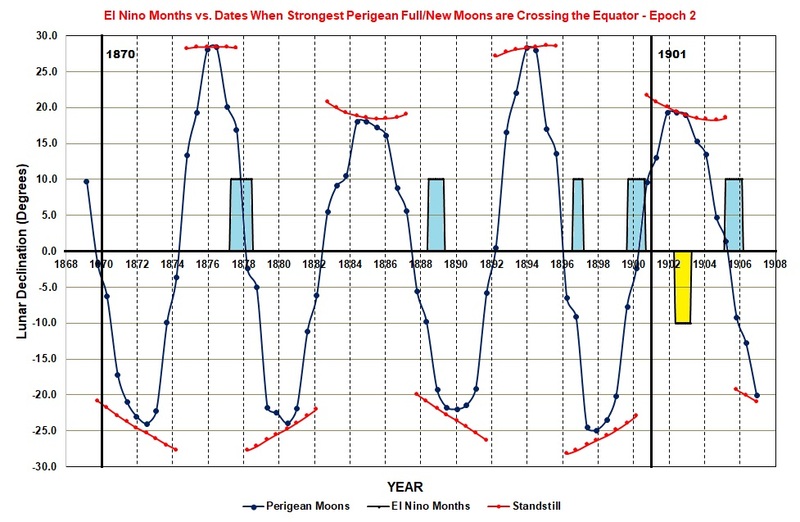 A comparison between the timing of El Niño months and the times at which the strongest Perigean New/Full moons approach lunar standstill, clearly show close alignments for eight out of ten of the moderate-to-strong El Niño events. This is in agreement with the findings of my earlier 2014 blog post regarding New Moon Epochs. Firstly, the next graph shows the astronomical declination of the strongest Perigean New/Full moon between 1992 and 2026 (solid blue line)(1). These are the strongest lunar tidal events during the 6th (Full moon) Epoch that spans the period between the 25th April 1994 to 27th April 2025. 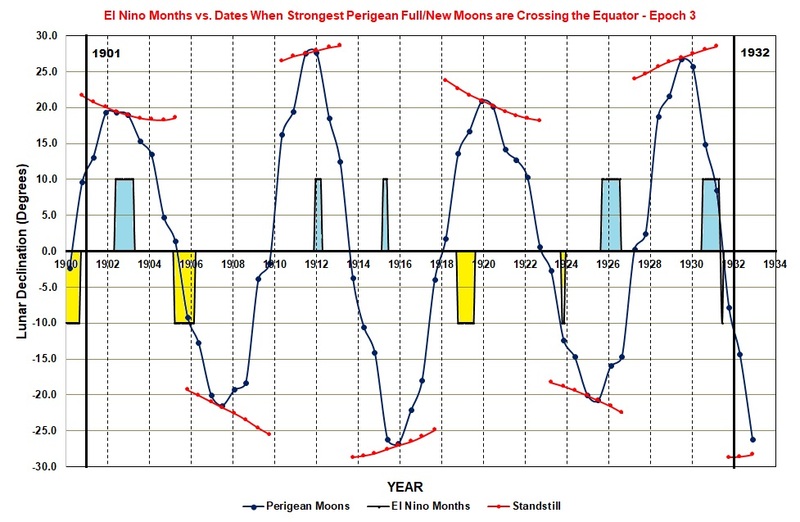 A comparison between the timing of El Niño months and the times at which the strongest Perigean New/Full moons cross the Earth's Equator, clearly show close alignments for six out of eight of the moderate-to-strong El Niño events. Again, this is in agreement with the findings of my earlier 2014 blog post regarding Full Moon Epochs. The Epoch 6 graph indicates that the next El Niño event should start sometime around the mid-to-late-2019. Though it has to be admitted that there is some uncertainty associated with the precise timing of this prediction.